In Cinemas in the UAE, Emirati artist Ammar Al Attar explores cultural practices around film, such as the weekly family ritual of attending the cinema, or the posters that exhibitors use to promote films for diverse audiences, offering us a glimpse into the history of film culture and theatrical film exhibition. He provides a comprehensive account of cinema culture in the UAE and Gulf, by reaching back to Al Mahatta, Sharjah, 1948, and the opening of the Royal Air Force Cinema, and bringing forth a wide range of stories which are often not acknowledged and in many cases unknown. 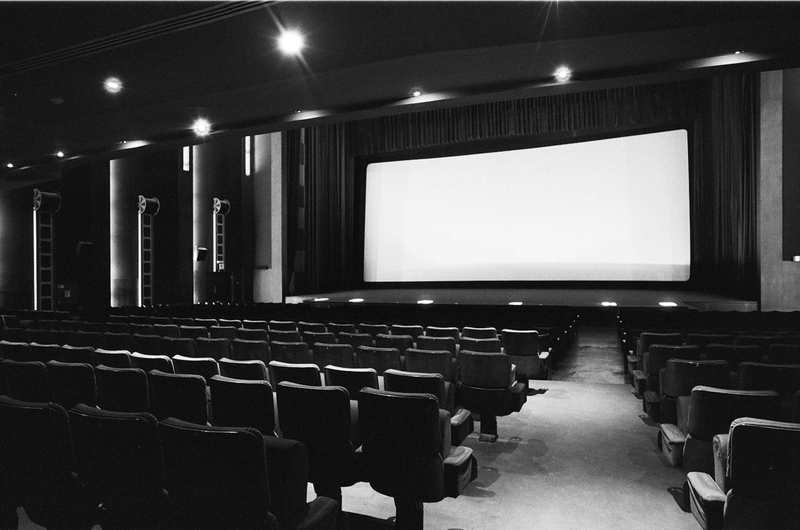 In the early 1970s, newly constructed standalone cinemas screened an eclectic array of films from Bangladesh, Egypt, Hollywood, India, Lebanon, Pakistan, and elsewhere, and served as places for communities to gather. As the UAE grew, these evolved into neighborhood cinemas offering increasingly community-centric programming for audiences which were often ignored by state-of-the-art mall multiplexes. Over the past three years, Al Attar has collected movie ephemera – ledgers that document formal and informal distribution of celluloid prints, flyers that were distributed by hand, and posters for films – that represent the material culture of cinema in UAE. He pairs these salvaged materials with his original photographs of cinemas before and during their demolition. The absence of humans in his imagery, has a haunting effect on the viewer, evoking a sense of the imminent extinction of a mode of life which is rapidly vanishing in the UAE and around the world. The exhibition is in conjunction with the Film and Visual Media in the Gulf: Images, Infrastructures, and Institutions: Connecting Africa, the Middle East, South Asia, and the World a conference convened by Alia Yunis and Dale Hudson October 28th–30th, 2018, at the NYUAD Institute. Over the past twenty years, Gulf film and visual media have shifted dramatically. This conference looks at redefining conceptual frameworks to render images and stories from the Gulf more legible, theorizing political economy within Gulf media, and strategizing ways to support sustainable visual media that acknowledges its connections with Africa, the Middle East, South Asia, and the world. Ammar Al Attar, born in 1981, is a self-taught photographer and mixed media artist. In his practice Al Attar seeks to document and translate, as well as methodically research and examine aspects of Emirati ritual, material culture, and geographic orientation that are increasingly illusive in this rapidly globalizing society. His work has been shown in solo and group exhibitions in the UAE and Gulf, has been recognized with an A.i.R residency and various prizes, and can be found in prestigious public and private collections throughout the Middle East. Ammar Al Attar lives and works in Ajman in the United Arab Emirates. He is represented by Cuadro Gallery in Dubai.